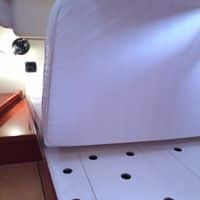 Many manufacturers will use fabric covered foam as a mattress in their boats, which leaves a lot of room for improvement. 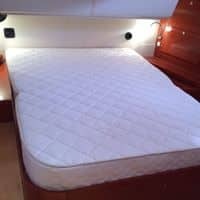 Yacht mattresses are a very personal purchase, because everyone has a different definition of comfort. We specialize in latex mattresses, which are fantastic for the marine environment. Not only are they mold and mildew resistant, but they regulate your body heat, allowing you to sleep cooler and they are very comfortable. Our latex mattresses are available in a number of firmness so you can get the ideal comfort. We do not charge extra to hinge your mattress, which is very convenient to access storage under the mattress. Contact us with the year, make and model of your boat for a quote, or, use our easy pricing structure to figure out the cost of your new mattress and boat bedding as well. For pricing purposes, we have 3 sizes SMALL (Up to 38″ wide), MEDIUM (39-60″wide) and LARGE (61-74″ wide). If your mattress is over 74″ wide, give us a call for a quote.